(Nanowerk News) A small blood lab that fits into the pocket of a jacket can quickly analyze the risk of blood clots in legs prior to a long distance flight; a sensor wristband for measuring electric smog can warn pacemaker patients of life-threatening exposure: "Smart plastics" can turn such tools into reality. The scientists at the Fraunhofer Institute for Reliability and Microintegration IZM in Munich are intensely working on these topics. Plastic chips monitor body functions. Each year, about 80,000 people in Germany become seriously ill from occlusions of veins caused by blood clots. Such thromboses can cause pulmonary embolism or even heart attacks. Even airline passengers at long distance flights can be affected by deep vein thrombosis. But with the new system, a fast and easy test of a risk of travel-related thrombosis will soon be possible. Airline passengers would only have to relinquish one drop of blood to the measuring device. The special feature of this miniscale lab-on-a-chip: the system is designed in plastic for an inexpensive production, sheets or reel-to-reel. This would facilitate cost-efficient manufacturing of disposable diagnostic systems. Such tiny analysis systems are still science fiction. In the EU project DVT-Imp (www.diagnosingdvt.com), researchers from eight European countries are developing essential foundations for the laboratory on the plastic chip. "This example shows clearly the possibilities for polytronics. In a networked world, oriented towards people, inexpensive, multifunctional systems are needed - for example in Assisted Living. In order to build up the infrastructure necessary for this, electronic systems have to be produced in large quantities, in a cost-effective manner on large substrates. And with polymer electronics, this would be perfectly possible," says Prof. Karlheinz Bock, head of the "Polytronic Systems" division at IZM. Polytronic, resp. polymer electronics, is a key technology that combines functional materials and electronics. A major advantage is the simple and inexpensive production: the polymer materials can be dissolved and then, like electronic ink, be recaptured through a printing process, structured on flexible sheets. "In this manner, we can construct small, handy and easy-to-use systems that for the most part make life easier for the sick and elderly," explains Bock. Assiduously at work on the engineering of the diagnostic systems for deep vein thrombosis are ten leading European research institutes and high tech firms. The core of the future analytical device, a lab-on-chip, was built and tested at IZM. It is a small, high-precision manufactured single-use cartridge that acts as a tool for the biochemical analysis of a drop of blood. It consists of a polycarbonate plate measuring 3 mm by 22 mm by 70 mm, and unites two critical components in one device: the most important component - a foil of 150 micrometers thickness, on which a filigree network with conductor lines and gold sensors for blood analysis is attached, as well as a 120 micrometer deep fluid channel for conducting blood to the analysis elements. Inside the sensor chamber, the antibodies are integrated on electrodes that allow to analyze the concentration of blood clotting markers. If the number is elevated, then the risk of a thrombus - i.e. a blood clot – is forming. But this system can be an important life companion not only for thrombosis-prone passengers on long-distance flights or stroke patients, but also for smokers, pregnant women or the obese. They will no longer have to wait days for lab results on possible clot forming in their blood. Just like glucose tests, a drop of the patient's blood suffices on the single-use cartridge the physician places then in a little hand-held scanner. Within minutes, the results appear on the display - and, if necessary, immediately apply the according measures. The EU project on the feasibility of the system runs until the middle of this year. The sensor wristband – also engineered at IZM - is suited for the long-term monitoring of various important body functions of older patients - but also of athletes. It is like a plastic wristwatch. Instead of a clock dial, the sensor wristband is equipped with an illuminated "electroluminescent display" that indicates for example the actual body temperature at any time of the day. It also detects skin moisture, which may be a sign for the dehydration of the patient or athlete. For a person with a pacemaker the patient wristband may also signal potential danger, indicating the strength of electric or electromagnetic fields in close proximity. A number of other applications are conceivable: if needed, the most diverse array of sensors can be integrated into the polytronic platform. 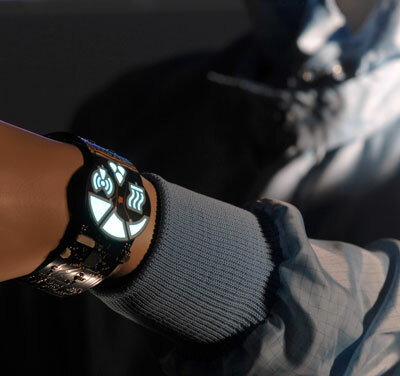 From a technical perspective, the sensory wristband is a combination of polymer and conventional electronics. Lighting elements, sensors and polymer resistances printed on the foils are connected into one system with integrated circuits made of silicon. A three micrometer-thin resonance circuit with an etched coil - a kind of minute antenna - records the electric smog. An interdigital capacitor attached to a foil and only 30 micrometers thick detects skin moisture. Comb-shaped, narrowly interlaced meanders made of copper bands of a mere 0.5 micrometer thickness, measure the body temperature. "The sensor wristband demonstrates the potential that lies within the flexible electronics mounted on foils," clarifies Prof. Bock. The tiny sensors and the optical functions are applied to the foils through a combination of technical printing and lithographic processes. The sensor wristband, just like the diagnostic device for deep vein thrombosis, can be manufactured cost-effectively both as individual sheets as well as by roll-to-roll production in larger batches.